Only when the masses are reassured, can the country be at peace. Only when the country is at peace, can the leaders be relieved. Wen Jiabao (born 15 September 1942) is a Chinese politician who was the Premier of the People's Republic of China from 2003 to 2013. The people agree that everyone should have his own visions. I, too, have visions, or wishes. I wish that every Chinese citizen can live a life of satisfaction, every peasant child can go to school and every person reaching a working age can have a job. I wish people wouldn't have to worry about medical care if they are sick, particularly those in rural areas. I believe that this is the dream of every Chinese person. Wen Jiabao (2004) cited in: South China Morning Post, 7 May 2004. China has established friendship with many African countries, and is opening itself up to Africa and providing assistance. It is cooperating with African countries on an equal basis and has no desire to colonize Africa. The speed of the fleet is not determined by the fastest vessel; rather it is determined by the slowest one. Sino-Japanese relations will certainly brighten more in the future and the flowers of friendly Sino-Japanese relations will increase their beauty. Translation: I only have one sentence to say: it is the people who kept you fed, so do as you see fit. Wen Jiabao (2008) cited in: "In Chinese:军队行动迟缓 温家宝怒摔电话". Renminbao.com. 16 May 2008. I can also tell you on the Internet in China, you can have access to a lot of postings that are quite critical about the government. It is exactly through reading these critical opinions on the Internet that we try to locate problems and further improve our work. I don't think a system or a government should fear critical opinions or views. Only by heeding those critical views would it be possible for us to further improve our work and make further progress. I frequently browse the Internet to learn about a situation. 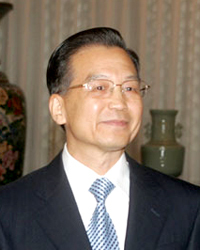 Wen Jiabao (2008) cited in: "Transcript of interview with Chinese Premier Wen Jiabao". CNN. 28 September 2008. Wen Jiabao (2010) cited in: Government Work Report, National People's Congress cited in "如何「讓權力在陽光下運行」". BBC. 28 September 2008. The Age - Who is Wen Jiabao? This page was last edited on 2 April 2019, at 14:50.